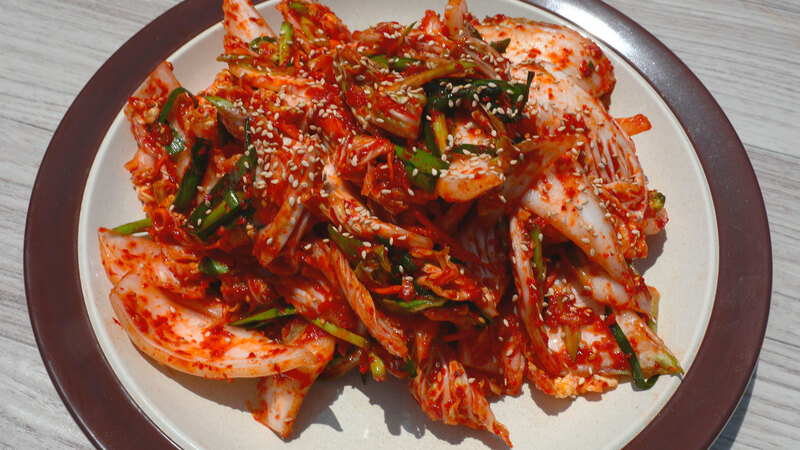 Today’s recipe is for quick, fresh, small-batch kimchi made with napa cabbage, called baeuchu-geotjeori. I make it Jeolla province style, with a thick paste made from fermented anchovies. I filmed this video in Yeongyang, where the best red peppers in Korea are grown, and is well known for hot pepper flakes, an essential ingredient for making kimchi. It’s one of a series of videos I filmed in Korea for the Korean government’s Agro-Trade agency (aT). They initially contacted me to ask if I had any ideas for videos following their theme of “Red, hot, and spicy.” I had a lot of ideas! One of them was for this video, where I could learn more about Korean hot pepper flakes from Yeongyang, which I had never been to. When I lived in Korea, like many Korean housewives to get hot pepper flakes I first bought sun dried peppers from the local market, cleaned them, and then had them ground at the local mill. When I moved to Canada that was impossible so I started buying bags of hot pepper flakes from the local Korean market. It was a new experience for me, so it was hard to find which brand to choose. I like to make kimchi with bright, red flakes so my kimchi is bright and red too, but I found it hard to find good, red flakes. Sometimes the most expensive flakes are more brownish than red. So with the Korean government’s help I got the chance to go to where the best Korean red pepper flakes are made and see for myself how they do it. I went to the factory in Yeongyang that makes the premium hot pepper flake brand Bitkkalchan and met the manager there. He explained to me that they chose only the best peppers from the region and reject the rest, then brought the peppers into their factory and washed them thoroughly. This was good to see because even in my old way I knew that my sun dried peppers were never really getting clean no matter how much I wiped them off. But I could see in his factory that the peppers were well cleaned, then chopped and dried at a low temperature in a special equipment. This way the peppers kept their bright red color and flavor. The whole process took only 3 hours, compared to the days and days of the old way. The hot pepper flakes they sell are kind of expensive, but after seeing their factory I decided to buy this brand from now on because I saw all their preparation myself and saw how careful and clean they are. And as you see in this video, the flakes are bright red, even when mixed with brownish fermented anchovies! It’s sold on Amazon in Very Spicy and Medium Spicy bags. While I was in Yeongyang I stayed in Dudeul village as a guest of Jo Gui-Bun who is the wife of the 13th generation descendant of Lady Jang, who wrote the first Korean cookbook in the Korean language in 1670, called the Eumsik dimibang. I stayed in her house, which was not only an honor but allowed me to eat her delicious food! While there we filmed this video for a quick, fresh kimchi called geotjeori. 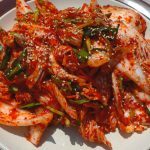 Unlike other kimchi it’s not made to last a long time, it’s made in a small batch you should eat right away in one sitting. You can refrigerate it and keep it longer if you want, but it will be kind of watery as time goes on. It’s supposed to be made and eaten rapidly as a side dish for rice, kalguksu (knife-cut noodle soup), or porridge. It’s pretty spicy and pungent with a deep flavor from the fermented anchovies. If you can’t find fermented anchovies, you can substitute with more fish sauce. When it came time for me to leave, Ms. Jo loved this baechu-geojeori so much that she asked me for the recipe. I told her that I would post the recipe and video on my website soon, but she said she didn’t want to wait that long and asked me to tell it to her right away! So I told her the recipe and she typed everything down into her smartphone. She’s a very passionate cook! Cut cabbage leaves lengthwise once or twice into strips about 1 inch wide. Cut each strip diagonally once or twice and put them into a large bowl. Add ½ cup water and sprinkle the salt over top. Toss the cabbage well with your hands to spread the salt evenly on the leaves. Salt for 30 minutes, tossing every 10 minutes. In a small saucepan add fermented salty anchovies, ½ cup water, and glutinous rice flour. Stir the mixture with a wooden spoon. Heat it over medium heat, stirring occasionally for about 4 to 5 minutes until all the fish is melted. Strain the mixture to a large bowl. Discard the fish bones in the strainer. Let the mixture cool down. Add hot pepper flakes and sugar. Mix it well with a wooden spoon. Add garlic, ginger, and onion to a food processor and grind it all for 1 minute until smooth. Add it to the hot pepper mixture and stir well. Add green onion, chives, and carrot and stir well. Rinse the cabbage in cold water, changing the water a couple of times until the cabbage is very clean. 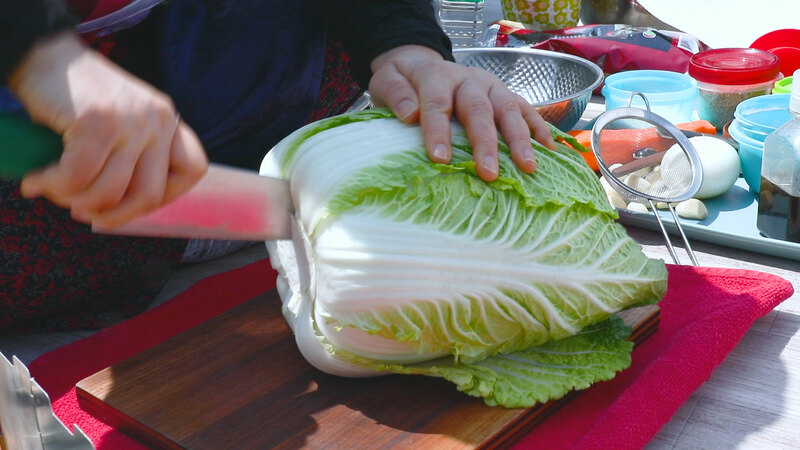 Drain the cabbage well and add it to the kimchi paste. Wear your kitchen gloves and mix everything well. Sprinkle the sesame seeds, and transfer to a plate and serve right away as a side dish for rice, kalguksu (knife-cut noodle soup), or porridge. Posted on Wednesday, May 30th, 2018 at 10:25 pm. Last updated on July 14, 2018. Posted November 11th, 2018 at 5:42 am | Log in to reply. Hello maangchi I want to ask may I use Anchovy fish sauce instead of regular fish sauce? Posted November 16th, 2018 at 8:43 am | Log in to reply. Posted December 7th, 2018 at 9:17 am | Log in to reply. Posted September 11th, 2018 at 1:03 am | Log in to reply. Hello, instead of the anchovies can i use ground shrimp? 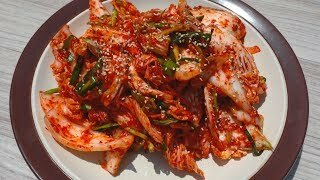 I’m asking this for your easy kimchi recipe that uses fresh squid as well. Thank you. Posted September 6th, 2018 at 3:05 pm | Log in to reply. I add this last night and it came out so great! Who needs store bought when you can make it easily at home? Posted September 23rd, 2018 at 9:54 am | Log in to reply. OMG! You made perfect geotjeori kimchi! Posted August 22nd, 2018 at 11:10 pm | Log in to reply. I made this with your porridge from the traditional kimchi recipe because I had no fermented Anchovies. I used an extra tablespoon of fish sauce for flavor. I’m letting it sit for a few days in a sealed ball jar before putting it in the refrigerator. Are there any dangers of botulism or sickness if I did not make it correctly? How will I know if it is unsafe to eat? Posted August 28th, 2018 at 8:52 am | Log in to reply. Don’t worry, it looks good! Posted August 8th, 2018 at 4:43 pm | Log in to reply. You mentioned that you live in Canada now. Do you buy the premium red pepper flakes from Amazon.ca? I couldn’t find it myself, so I’m wondering where you get it. Thanks! Posted August 13th, 2018 at 9:00 am | Log in to reply. I mentioned that I used to live in Canada in the video. I’m living in New York City now. I hope that Amazon Canada is selling this product, it’s really great. I’ll keep using them unless I find a better one. Posted June 12th, 2018 at 4:30 pm | Log in to reply. When you use up kimchi juice for recipes, how can you replace it without wasting lots of cabbage and vegetables? as you said they should be kept under the kimchi juices? Posted June 6th, 2018 at 12:01 pm | Log in to reply. One day you should offer a cooking andfarming tour in Korea! It might be expensive but I think very popular! Posted June 6th, 2018 at 11:57 am | Log in to reply. This is my favorite video of yours! I love little bits of food history and food growing! The area you visited looks so beautiful and peaceful. I’ve told you before I was born in Korea and adopted in 1974 with my sister. I hope to visit Korea one day! Sharing food and learning about growing food is a passion of mine. This quick Kim chi looks so fresh and delicious! I actually prefer to taste of fresh Kim chi. I was smiling inside the whole time watching this video- very touching to see a bit of culture. Thank you! Posted June 14th, 2018 at 8:40 am | Log in to reply. While I’m reading your comment I feel like you are a real Korean. Even though you were adopted in America a long time ago, you still feel Korean in your pallet, because you love fresh kimchi. Posted September 5th, 2018 at 1:08 am | Log in to reply. Lisa, my story is so similar. I was adopted in 1970. I was raised by a Korean Mother and African American Father. He was a soldier in the US Army. I even did an ancestry DNA kit to make sure I was part Korean and I am very proud to say that I am. Thanks to Maangchi, I too am able to appreciate the history and the honor of our great culture. Posted June 3rd, 2018 at 8:58 pm | Log in to reply. Thank you so much for posting this video in Doodeul and showcasing agri-tourism. I am very interested in Korean history and found this 30′ video about Jang Gye-Hyang and Eumsikdimibang, and am sharing the link in case there are others interested in Korean history: https://www.youtube.com/watch?v=P8DkQOPH204. There is also a slightly longer version in Korean (without subtitles): https://www.youtube.com/watch?v=jLWck5qP1RM. Posted June 14th, 2018 at 8:41 am | Log in to reply. Posted June 3rd, 2018 at 12:47 pm | Log in to reply. Posted June 2nd, 2018 at 1:28 am | Log in to reply. What if i cannot find the fermented anchovies? What can i substitute that from? I wish to made that soon. Posted June 2nd, 2018 at 3:03 am | Log in to reply. Use fish sauce. Make porridge without fermented anchovies and cool it down. Then add 2 tablespoons fish sauce along with other ingredients. Posted June 2nd, 2018 at 1:08 am | Log in to reply. Would it also work to use left-over kimchi paste from your traditional recipe? I’m going to the new H-Mart in Paramus in the morning thank you for teaching me to cook Korean cuisine! It’s the best Cuisine in the world!! Posted May 31st, 2018 at 10:52 am | Log in to reply. I was wondering if sae-woo (shrimp) jeot works with this recipe instead of myeol-chi jeot. If it does, would I have to cook it as well? Posted June 2nd, 2018 at 3:14 am | Log in to reply. I would use fish sauce if fermented anchovies are not available. Saeujeot can be added along with fish sauce but saeujeot by it self won’t make delicious geotjeori. Besides saeujeot shouldn’t be cooked. This recipe was originally posted on May 30, 2018 at 10:25 pm by Maangchi. It was last updated on July 14, 2018. The video was watched 424,677 times on YouTube & has 15,212 likes!